Socialte Corazon has been full of surprises this week, from taking photos next to a super expensive cars owned by one of his sponsors to buying a new house in one of Nairobi's posh places. This time its totally different. The socialite decided to take Maina Kageni's advice on domestic tourism and went to visit a few places in Kisumu. She decided to be a little adventurous and took the famous 'Peng' ride around Kisumu city. 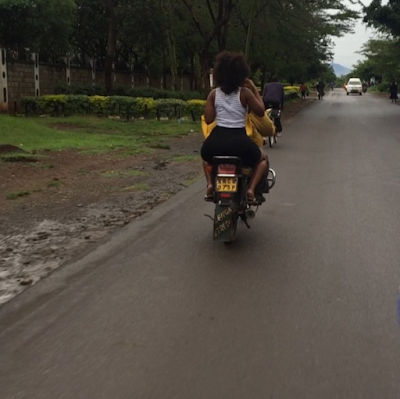 The ride which was only a kilometer long, was charged only 50 bob but felt really good especially to Corazon who is used to driving around in expensive cars. Check out the photo and video below.